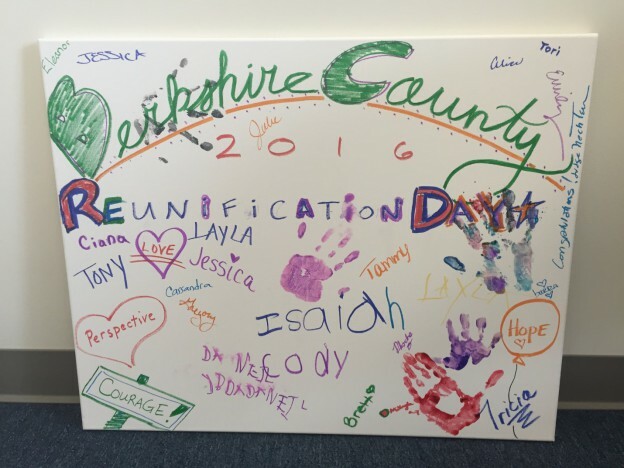 On Tuesday, June 28, 2016, for the first time in Berkshire County, local agencies hosted a Reunification Day Celebration to recognize the reunification of families after separation through the child welfare system. This event was hosted by Berkshire Children & Families, the Department of Children and Families, and the Committee for Public Counsel Services – Children and Family Law Division (CAFL), in collaboration with the Berkshire Juvenile Court and the local bar. 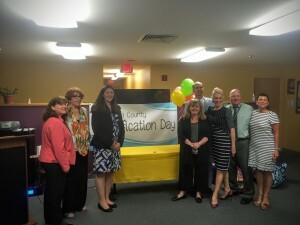 The two hour celebration was held at the Berkshire Children and Families’ Family Resource Center and honored local families for their reunification success. The Honorable Amy L. Nechtem, Chief Justice of Juvenile Department of the Massachusetts Trial Court, the Honorable Joan M. McMenemy, First Justice of the Berkshire Juvenile Court, Carolyn Burns, CEO & President of Berkshire Children and Families, and Margie Gilberti, Pittsfield DCF Director of Areas addressed the audience. Brian Litscher, a local CAFL panel attorney, entertained the crowd with an acapella performance of “Somewhere” from West Side Story. The honored families were presented with passes donated by local attractions, and gifts that were generously provided by CAFL. Arts and crafts and face painting followed the structured portion of the celebration. A commemorative canvas, donated by CAFL panel attorney, Peter Brewer, was decorated and will be displayed in the Berkshire Juvenile Court. This event was held in connection with the American Bar Association’s National Reunification Month. National Reunification Month is celebrated around the country every June to honor the importance of the reunification of children with their families in the child welfare system. The event was first celebrated in 2010 by the American Bar Association in collaboration with many national agencies. National Reunification Month celebrates the accomplishments of families who have overcome an array of challenges to safely reunify, recognizes the vital role that community partners play in strengthening families, and is designed to inspire other families in pursuit of successful reunification. This entry was posted in Children and Family Law on July 21, 2016 by jprince. Sad news as another giant from the indigent defense world has passed away. 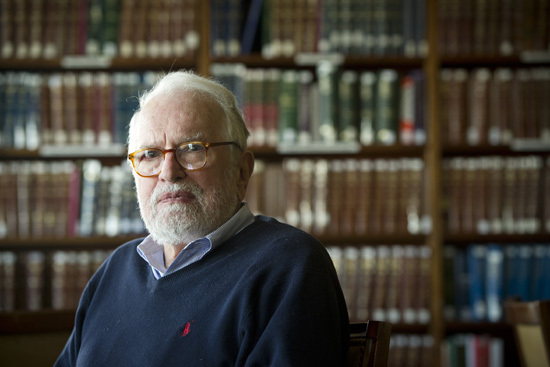 Robert (Bob) Spangenberg, who spent a lifetime working to improve access to counsel for the poor in criminal and civil cases died late last month at age 83. In the 1960’s, as an advisor to the Lyndon Johnson administration, Bob was instrumental in the creation of the Office of Legal Services, the precursor of the Legal Services Corporation. Having helped establish the largest national civil legal aid funder, Bob turned his attention to Boston, where he helped found the organization now known as Greater Boston Legal Services. Before settling in the Commonwealth, Bob was called back to Washington to serve as Special Assistant to the first Director of the National Legal Services Program. Bob returned to Boston to become the Executive Director of the Boston Bar Association’s Action Plan for Legal Services. During his tenure, The Action Plan conducted in-depth research into the legal needs of the Commonwealth’s indigents. The Action Plan’s findings helped prompt the 1983 legislation which created the Committee for Public Counsel Services. Bob served as a CPCS board member from its inception until 1995 and remained a strong supporter in the years after. In 1985, Bob formed The Spangenberg Group (TSG). For a quarter of a century TSG conducted research and provided technical assistance to civil and criminal legal systems around the United States and throughout the world. During this period Bob testified before Congress and numerous state legislatures, leading to positive change in the delivery of legal services in many jurisdictions. TSG’s work contributed to a critical rate increase for CPCS private assigned counsel. Bob and TSG provided key information and expertise to CPCS in the Lavallee (Nathaniel Lavallee, et al. vs. The Justices of the Springfield District Court, 442 Mass. 228 (2004)) and the Arianna (Arianna S., et al. v. Commonwealth of Massachusetts, et al., SJ-2004-0282 (filed June 28, 2004)) cases. As result of Lavallee and Arianna, the state legislature enacted hourly rate increases in criminal, juvenile and child welfare cases, and instigated the creation of the first CPCS District Court staff offices. In 2009, Bob received the Champion of Indigent Defense award for outstanding efforts in making positive changes to indigent defense systems from the National Association of Criminal Defense Lawyers. The National Legal Aid and Defender Association Reginald Heber Smith award, as well as the Texas Task Force on Indigent Defense Robert O. Dawson award were presented to Bob in 2008. In addition, Bob was the recipient of the ABA Standing Committee on Legal Aid and Indigent Defendants (SCLAID) Lifetime Achievement Award. Bob was extremely generous with his time and expertise, always willing to answer a call for advice. He maintained a keen interest in CPCS, often calling to check in on the never-ending battle for increased funding, or to get more details about a story he had seen in the press. Bob Spangenberg will be sorely missed. His work benefitted scores of individuals. Although still inadequate, because of Bob the services available to indigent defendants and civil legal aid clients in the Commonwealth are significantly better than those provided in most other parts of the country. This entry was posted in Chief Counsel's Office and tagged remembrance on July 5, 2016 by dsimonini.